Of all the possible paths to fame and fortune, setting up a whiskey still in the back yard is one of the longer shots. But that’s just how Rob Robillard hit the big time. In 2001, Robillard decided to get out of the electronics business and make a maple whiskey. He knew his dad was handy, so he asked him to build a still in his Chester back yard. They named the still “Buck,” rallied some family and friends to help with the process and released Cabin Fever Maple Whisky (no “e”) in 2007. Buck has long since been retired, though Rob keeps it around. (He’s posing with it in the above photo.) Now the distilling is done by one of the largest companies in the country and his product is distributed nationally. Describe “Buck” to our readers. It’s just a couple of lobster pots welded together with a copper pipe stuffed with stainless-steel wool. I still fire it up once in a while. It works like a charm. There must have been some bad batches early on. How did you know when you had a winner ? Well, practice does make perfect. I originally started distilling for my friends and family, not to sell in stores. I knew I had a winner when strangers were coming to my house looking for my maple whisky. My wife said either sell it in stores or put the still in the dumpster. What’s something most people don’t know about making whisky? Whisky comes out of the still clear. Sitting in the barrel is what gives it its color. 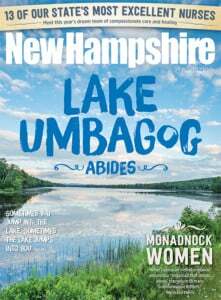 New Hampshire Magazine has to ask this, why did you choose to use Vermont maple syrup? That’s a good question, even my mother gave me a hard time with that one. She’s like, “Why don’t you just get it from the guy down the street?” Vermont is the biggest producer in the country and they use a co-op, so it’s a blend of everyone’s, that makes it more constant. You get invited to talk about your success a lot. What’s another good question that you get asked? I was the keynote speaker at the Beer, Bourbon & BBQ event in NYC a couple of months ago. A woman asked, “Did you ever envision it getting this big?” I told her, I was so naive in the beginning I never realized I would be competing against billion-dollar companies. Not to mention, the odds are a bit long, Each year, 300 new brands are registered with the Feds. After five years, less than 10 are still registered. I just said to myself that I’m going forward with this until someone can give me a good enough reason not to. You’ve sold the brand. Do you continue to represent it? Yeah, I partnered with Diageo, the world’s largest liquor company. We were in 13 states and it was getting to be so much. Even with my brother and my sisters-in-law, Julie and Sue Wright, we were swamped. Today, we still go to events but we pace ourselves a lot more. What’s your next adventure? Everyone and his brother is doing flavored whisky now, so that’s out. I’ve been playing with brandies and discovering innovative ways to age spirits. I plan on releasing another brand in the near future. You’ll have to stay tuned.